Thinksport, the most award-winning sunscreen on the market, has a message: sunscreen season is not over! Even though cooler weather is approaching, the sun’s rays are just as powerful and damaging. “Thinksport Everyday Face sunscreen is highly effective, falls into the highest category for water resistance and UVA/UVB protection as proposed by the FDA’s 2012 rule and has a sensible SPF 30+ rating,” said Kevin Brodwick, Founder of Thinksport and Thinkbaby. Thinksport, the most award-winning sunscreen on the market, has a message: sunscreen season is not over! Even though cooler weather is approaching, the sun’s rays are just as powerful and damaging. 95% of all the UV radiation is UVA. UVA radiation contributes to wrinkles and skin cancer, and is prevalent year round, not just during the summer. When it’s a gloomy day, it’s just as important to protect your skin. In fact, Oregon and Washington, some of the gloomier states, are listed in the top 10 states with the highest level of Melanoma, both 29% higher than the national average. The most commonly diagnosed form of cancer in the United States is skin cancer. Most of the time this is preventable. Using sunscreen is a key factor in preventing skin cancer. But make sure the sunscreen is safe and free from biologically harmful chemicals. 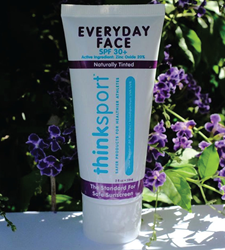 Thinksport’s Everyday Face was created because of the need for a safer solution without the harmful chemicals found in a majority of products/formulas on the market. Compare Everyday Face ingredients to other sunscreen solutions on http://www.EWG.org/skindeep. Everyday Face is enriched with Vitamin C & E and includes a small amount of tint to reduce any whitening effect from minerals. Supremely moisturizing yet gentle enough for sensitive skin, the formula dries very quickly and provides an excellent base layer before makeup application. Worry not! Everyday Face tint has been tested on some of the finickiest faces. The sunscreen blends seamlessly into all skin tones. Bundle and save with Thinksport’s Body Bundle. Buy a Thinksport Everyday Face, Thinksport Sunscreen Stick, Thinksport Sunscreen, and a free Thinksport Lotion!